​The primary purpose of the Girodisc system is to reduce unsprung and overall vehicle weight. The secondary purpose is to increase the ventilation and cooling capacity of the brake disc while retaining it's original dimensions. This is accomplished by using two-piece disc construction. The central “hat” section of the disc is made from 6061-T6 aircraft specification aluminum. Q: What is required to install the Girodisc system? A: The Girodisc system is a direct replacement for the OE disc. No modifications are necessary. The disc will bolt directly to the car and work with OE calipers and pads perfectly. Once the Girodisc system is in place, simply replace the cast iron rotor when needed. Some discs are larger in diameter and come with caliper spacers. If longer bolts are required, they are also supplied. Q: How does reducing weight of the braking system benefit the vehicle? A: The Girodisc will generally weigh between 4 – 8 lbs less than the oe disc it will replace. This is due to the heavy cast iron hat section being replaced with lightweight, high strength aluminum. The mass of any vehicle requires energy to accelerate or decelerate. Reducing the vehicle mass improves acceleration, and requires less energy to be dissipated during deceleration. Rotating mass requires additional energy in order to increase or decrease its speed of rotation. Decreasing the mass of the disc has a great benefit due to reduction in rotational inertia. This will allow more of the braking force to be available to decelerate the vehicle, not the disc. Additionally, the mass of the brake system is also unsprung mass. Reducing the unsprung mass has the additional benefit of improved suspension performance, resulting in enhanced ride and handling. 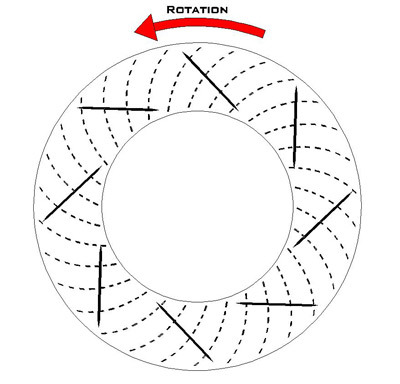 Rotating masses require additional energy to vary the plane on which they turn. The lighter the disc, the quicker the response of the vehicle steering due to the reduction in gyroscopic effect/rotational inertia of the disc. As an example, compare the weight of the Ferrari 360 OE disc at 18.2 lbs, and the Girodisc at 14 lbs. The Girodisc is 4.2 lbs lighter per disc. Replacing all four discs will save 16.8 lbs of rotating, unsprung mass. A: The edges of the slots continuously clean and refresh the pad surface. This will allow the pads to have a maximized friction surface always available. Additionally, they prevent containments from collecting between the pad and disc interface. The disc is lightened, decreasing its rotational inertia. Slots prevent the formation of a water film on the disc in wet weather, maintaining the best brake response. Girodisc does not recommend drilled discs for high performance applications. The rapid heating and cooling cycles will cause cracking on the friction surface of a drilled disc. 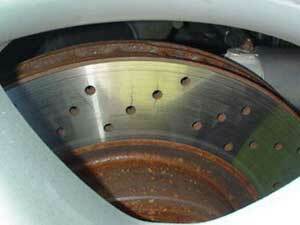 The use of high friction or racing pads will exaggerate this condition. Most pad manufacturers specifically recommend that their race pads not be used on a drilled disc for this reason. Girodisc can drill discs for an additional fee, if the customer is aware of the potential hazards of drilling the discs. Note as example the cracking in this OE Ferrari 550 drilled disc after one track day. Also note this custom front disc of a Porsche 993 Turbo after hard use. 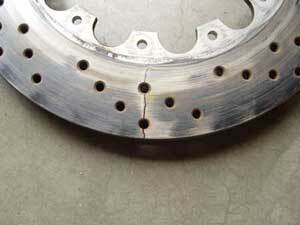 Below is an example of OE Ferrari 550 drilled disc showing cracks after one weekend of hard track use. Q: Should new discs and pads be bedded in and if so, how? A: The answer is yes, for optimum performance, any time different friction materials or discs are introduced, a bedding procedure should be carried out. Refer to procedure. Q: Which direction should the discs rotate? A: For maximum airflow and superior cooling, the Girodisc system uses curved vanes. For a curved vane internally vented disc, the geometry of the vanes dictates the direction of rotation. A curved vane disc must be installed with the vanes running back from the inside to outside diameters in the direction of rotation. Your discs will come with labels indicating their correct placement on the vehicle. Orienting the disc in this manner creates a centrifugal pump. The rotation of the disc causes air to be pumped from the center of the disc, through the vanes, and out through the outside diameter of the disc. This greatly enhances the disc’s ability to dissipate heat. Discs installed backwards have very limited cooling.